Seriously Lucario EX? 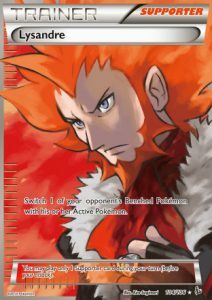 Lysandre? Are you kidding me? 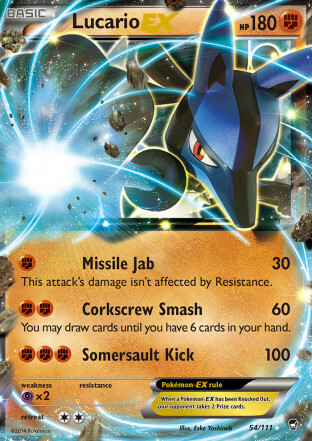 Lucario EX and Lysandre? Did they not notice that these cards aren’t even commonly played in Expanded? Wailord finished second at the last Expanded tournament in Virginia. Korrina was in the first place list. Why not give us cards on the ladder that are at least useful in expanded? And how many people are even playing in that arena? Limitlesstcg.com has sixty-four tournaments listed on their site for the 2017-2018 season, dating all the way back to Liverpool on July 29 2017. Guess how many of them are Expanded? That’s less than one out of every seven tournaments. And the attendance? 4,540 heads sounds pretty good for Expanded… until you compare that to the 15,132 players who went to Standard events. I get it Pokemon is trying to push the Expanded format to make that more of a thing. Could you at least give us decent cards on the ladder then? Well, at least this makes moving to the new Standard format a much easier decision. Come August 3rd, send me an invite if you want to play in the new meta. I certainly have no motivation now to play in the old one. Previous Post:The Reign of Rayquaza Begins August 3rd! I mean think about it. You want people to climb the ladder? Put a full art Ultra Ball up there – something that’s used in both Standard and Expanded. FA Cynthia. FA secret rare Buzzwole. Watch how many people would flock to PTCGO. Lucario EX? Lysandre? Maybe I should just play Fortnight for the next couple of weeks (I’m kidding I’ve never played Fortnight but I’ll probably do more writing than playing. Maybe even find some time alone to post a video…. Harvey I believe you might want to consider expanded once more: Ghestis, Puzzles, Wally, and Hex Maniac are all banned in Expanded starting later this August!! And Tapu Lele GX is getting reprinted so to everyone at Pokedeck Central, rejoice: Lele decks become budget now….inb4 the secondary market jeopardizes this.